The fourth book from the 2 Michelin-starred chef, with over 100 amazing recipes for effortless home cooking. The fourth book from the 2 Michelin-starred chef, with over 100 amazing recipes for effortless home cooking. With two children and a busy professional life as a chef with restaurants in Cornwall, London and Dubai, Nathan knows how hard it is to juggle cooking for the family with a hectic work schedule. In his Home Kitchen, Nathan offers over 100 recipes, covering all kinds of food, to inspire and improve your cooking. From sustaining breakfasts and lovely lunches, such as crab and chilli omelette and satay quail salad, through the best ever Sunday roasts and accompaniments, to easy everyday dinners like chicken and leek pie and breaded hake with tartare sauce, everything is approachable and flavourful. For special occasions there are enticing ideas such as prawn and champagne risotto and barbecued butterflied leg of lamb, and to round off the dinner, how about sticky toffee pudding or elderflower custard tart with poached gooseberries? 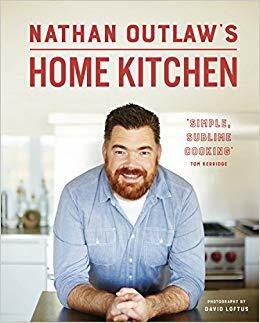 Nathan’s approach to cooking is honest and straightforward – no messing about when it comes to good food for family and friends – and these are all the recipes you will ever need.